Home › Latest Promotions › CUSTOMISE YOUR RIDE ON US! 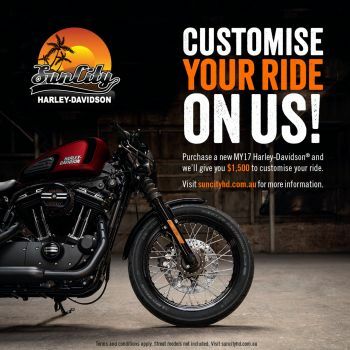 CUSTOMISE YOUR RIDE ON US! Your custom journey starts here. Purchase a new MY17 Harley-Davidson® from Suncity H-D® and we'll give you $1,500 of Parts and Accessories to customise your ride! Make it yours and unleash your creativity. Contact one of our Sales Team today! Terms and Conditions: Offer only valid on MY17 Harley-Davidson® motorcycles excluding Street 500™ and Street Rod™ models. Cannot be exchanged for cash. Offer valid until 30th September, 2017.